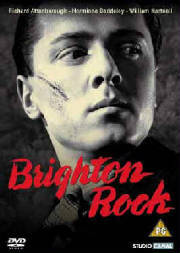 A hard-edged, multi-faceted thriller, which truly was from the golden edge of British film-making.This how Brighton Rock has been described by many who have viewed it, and quite rightly so as well. 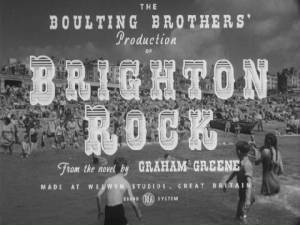 It is the late 1930s and Brighton is run by a number of vicious gangs, one of these is led by the vicious, sociopathic teenager Pinkie Brown. 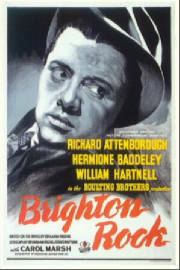 After killing a man at the fairground, he tries to establish a watertight alibi - even if it means marrying Rose a possible witness to his crime, to prevent her giving evidence against him. 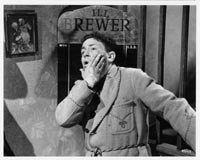 A reviewer at the time of the film's release called it "false, nasty cheap sensationalism", which to entirely miss the whole point of the film. 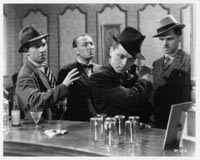 Most critics, then and now, have praised the film for it's ivocation of time and place, the realism of the settings, and the juxtaposing of those settings against one another. The cosiness of a teashop and the nastiness and menace of the gangs activities. This film is available in both the VHS and DVD formats, track it down and purchase it, it'll be well worth your time.